Hearts of gold and fists of steel make for an interesting partnership. Dark Horse wants to give readers a glimpse into that dynamic by publishing The Big Guy and Rusty the Boy Robot hardcover collection. From the minds of Geof Darrow and Frank Miller, the duo is set to return in a big way after the previous collaboration on Hard Boiled. Everything you remember about being eight years old and watching monster movies is right here, but with all the magnified detail that you always wanted to see, collected in hardcover for the first time ever. With remastered color by the inimitable Dave Stewart, this stunning edition includes the Dark Horse Presents special and surprise extras. Preorder your copy of the Big Guy and Rusty the Boy Robot hardcover edition, coming in October 2015, from Amazon, Barnes & Noble or IndieBound or contact a local comic shop through Comic Shop Locator. Dark Horse to Publish ‘The Big Guy and Rusty the Boy Robot’ Hardcover Collection! Hearts of gold, fists of steel! FOR IMMEDIATE RELEASE: MILWAUKIE, OR—Front and center, kiddos! Here comes action! Here comes adventure! Here comes The Big Guy and Rusty the Boy Robot—a roller-coaster ride through the minds of Geof Darrow and Frank Miller, the tag team that set you reeling with their hard-hitting series Hard Boiled! Everything you remember about being eight years old and watching monster movies is right here, but with all the magnified detail that you always wanted to see, collected in hardcover for the first time ever! With remastered color by the inimitable Dave Stewart, this stunning edition includes the Dark Horse Presents special and surprise extras! Preorder your copy of the Big Guy and Rusty the Boy Robot hardcover edition, coming in October 2015, fromAmazon, Barnes & Noble, or IndieBound, or contact a local comic shop through Comic Shop Locator. 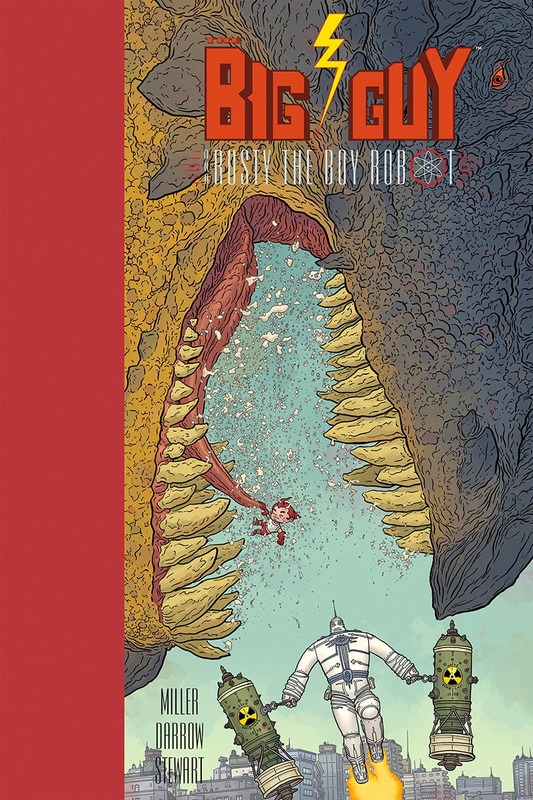 Read the exclusive interview with Geof Darrow only on Newsarama! Founded in 1986 by Mike Richardson, Dark Horse Comics has proven to be a solid example of how integrity and innovation can help broaden a unique storytelling medium and establish a small, homegrown company as an industry giant. The company is known for the progressive and creator-friendly atmosphere it provides for writers and artists. In addition to publishing comics from top talent, such as Frank Miller, Geof Darrow, Mike Mignola, Neil Gaiman, Brian Wood, Gerard Way, Felicia Day, and Guillermo del Toro, and comics legends, such as Will Eisner, Neal Adams, and Jim Steranko, Dark Horse has developed its own successful properties, such as The Mask, Ghost, Timecop, and SpyBoy. Its successful line of comics and products based on popular properties includes Mass Effect, Buffy the Vampire Slayer, Aliens, Conan, EVE Online, Halo, Serenity, Game of Thrones, and Domo. Today Dark Horse Comics is the largest independent comic book publisher in the US and is recognized as one of the world’s leading publishers of both creator-owned content and licensed comics material.